Last week I spoke to Gibson about his collaboration in his new comic, Undertow (click here for review). This week however it is Gregs turn in the hot-seat, and what he thinks about comics, movies, banana's, and the price of lint. OK, not exactly all of those grand topics of note, but some of them anyway. Here, check out some of Greg's missives whilst juggling a small child with his left hand tied behind his back. 1) When was the first time you knew that you wanted to create a comic book? And did the story come first or the aspiration? I was creating at a very young age. I started reading comics as a child, going to my Grandma Velma’s house on the weekends. I’d save my allowance (of course Grandma and mom contributed to my habit) and buy whatever caught my eye on the grocery store newsstand. It was great, everything from the classic Hulk, Spider-Man, JLA, Conan, to the war comics, to Swamp Thing, throw in some Doctor Strange and it was a very eclectic mix of inspiring comics. They influenced an already artistic child to draw those characters and later to self-publish my own works. They also encouraged me to read, and any kind of reading is a good. As for making them for a living, it was around the time my dad was losing his battle with brain cancer. I didn’t want to leave anything undone that I wanted to do in this life, which is also around the time that Roman Morales III asked me to join his Third Empire Studio, 2005/2006. To answer the second part of the question, Both, it depends on the book or story. An idea without action isn't going to get a book made. Inspiration has to have execution. 2) What was the last mainstream comic book you read? And what do you think of mainstream wares nowadays? I have bought a lot of the DC 52 books, never read them much before the New 52. 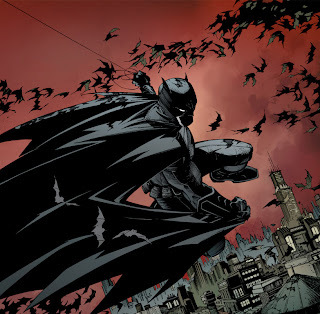 I love Scott Snyder’s work, so American Vampire, Swamp Thing, and Batman with Capullo’s art are awesome reads! Lady Mechanika is another awesome book. Locke and Key as well as The Walking Dead are on my pull list also! I usually will give books/art teams a chance, but if I don’t enjoy the books, they get dropped. I think more fans should cast there vote this way, the industry would respond to the challenge. I also pick up the Stephen King books published by Marvel. IDW and Archaia have an awesome lineup as well. 3) If your style of art was a movie, a piece of music, or an object, what would it be and why? Not really sure how to answer this...Scooby Doo always looking for a Scooby Snack...? 4) What was your first piece of commercial work? And what did you take away from this experience. In high school as a 9th grader, I was commissioned to do the cover of a book of poems. I got paid 25 dollars. Network, be professional, finish the work on schedule, and always ask for more and negotiate down to a reasonable price. 5) What was your experience like when you recently visited the New Orleans Comic Con? New Orleans is a great city with great fans! I had a lot of fun! 6) What is your own personal opinion on telling a tale? Or more specifically, how movies and the media in general are currently doing it. First off, can we come up with something new, and quit rehashing the old shows/movies/tales. I try to be as original as possible, or at least put my own twist to it. As for my art, I look at the masters but try to make it my own, put the Harms on it! 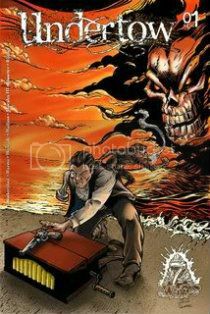 7) In your own words, how would you describe your comic book, Undertow? An anthology with interesting, fun, exciting stories. 8) During your time as an artist, what is the one thing that has kept you in good stead? Paychecks help... but a good work ethic is invaluable. 9) Do you have any tips or advice for an aspiring artist? Practice, practice, practice and then when you are tired of it, do it again. Also, work over someone else’s pencils. There are several good books on how to ink, grab one and start inking, experiment with tools and paper. Just learn every aspect of it that you can, and work over several artist with different styles and try inking in different styles. It all makes you a better artist/inker. So there is my second interview with one of the Undertow trio, Greg Hams. When you have the time, please check out his preview of Undertow #2 at 7thwavecomics, and stay tuned for Lukes interview coming up very soon.